Sony has announced a ghoulishly delightful sale across PlayStation platforms with a Halloween-branded “Sale of the Dead”. From today until November 2nd at 11 AM ET, multiple games, horrific or not, are on sale up to 50% off, especially for PlayStation Plus members. 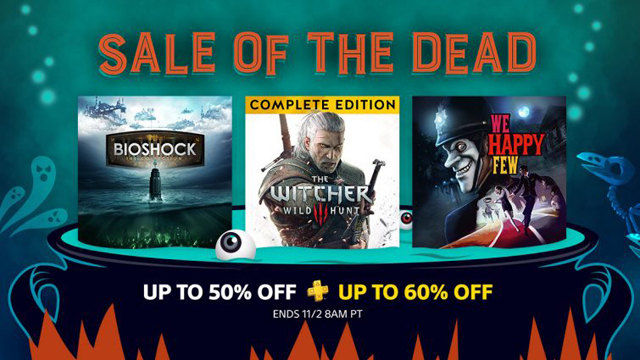 Note that this sale is North America-only, the country where All-Hallows Eve is arguably the most popular in the world. The whole list of games are listed below, and the PlayStation 4 list in particular is stacked with great deals and a high volume of titles. Most noteworthy are The Witcher 3: Wild Hunt, Bioshock: The Collection, and multiple Capcom remasters like Devil May Cry and Resident Evil.